Charts: How Much Have the Kochs Spent on the 2012 Election? See how much the billionaire brothers have spent in your state—and why the size of their campaign to beat Obama is a mystery. 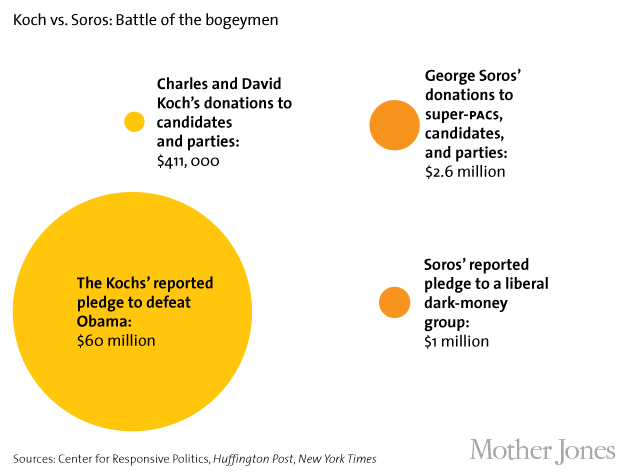 Charles and David Koch arguably have been liberals’ biggest bogeymen of the 2012 election. Just as conservatives have come to see George Soros as the mastermind of a shadowy leftist network, the billionaire brothers have become synonymous with the dark-money machine working to defeat Barack Obama. By their own admission, the Kochs have been raising millions to sway voters. At a closed-door gathering of like-minded megadonors in 2011, Charles Koch declared that the upcoming election would be a battle “for the life or death of this country” and that “we gotta do better than” the president’s expected $1 billion war chest. 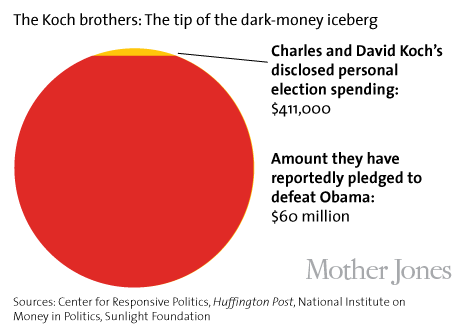 So just how much money have the brothers poured into the election? That’s a tricky question, as we’ll see in a moment. But first, how much are the Kochs, their companies, and Americans for Prosperity (the dark money group they’re connected to) known to have spent so far? Click on a state for a detailed breakdown. In total, Koch Industries and its affiliates Georgia-Pacific and Flint Hills Resources have given more than $2.2 million to candidates and parties during this election cycle. Koch Industries recently asserted that its support for candidates “is not based on party affiliation, and we support both Republicans and Democrats who support market-based policies and solutions.” Yet 95 percent of its corporate donations in 2011 and 2012 have gone to Republicans. Charles and David Koch have given a combined total of $411,000 to federal and state candidates and parties during this election cycle, all of it to Republicans. Just how much the Kochs have given AFP or other dark-money groups is unknown. Earlier this year, the Huffington Post reported that Charles Koch has pledged to give $40 million to unseat Obama while David Koch has pledged $20 million. (Their friends and allies have also pledged to help them raise additional millions.) Neither brother has donated to super-PACs (which must disclose their donors), so presumably that money has gone to dark-money groups such as AFP. Which means that the $411,000 in disclosed donations is just the tip of an iceberg of undisclosed campaign money. The $60 million the Kochs have reportedly vowed to spend isn’t much when you consider their total wealth. Each brother is worth an estimated $31 billion, according to Forbes, giving them a joint spot as America’s fourth richest individuals. Charles and David Koch aren’t the only Koch brothers to have backed up their political beliefs with big money. Their sibling William has given $2.75 million to Restore Our Future, the main pro-Romney super-PAC. (The donations were given directly by his company, Oxbow Carbon.) He is not part of Koch Industries and has not been involved in his brothers’ political fundraising efforts. He’s worth $4 billion, and like his brothers, he has plenty of money for his passions—though politics may be one of his less expensive ones. UPDATE: What about George Soros, you ask? The liberal financier and 12th-richest American has spent $2.6 million during this election cycle; $2.5 million of that has gone to four liberal super-PACs. Some of those groups, such as Priorities USA Action, the main pro-Obama super-PAC, have disclosed more spending than Americans for Prosperity. According to the New York Times, he was also going to give $1 million to America Votes, a liberal super-PAC/501(c)(4) outfit. Even if he made that undisclosed gift, unless Soros is matching the Kochs in under-the-radar spending, they’re in an entirely different league of megadonors. Correction: An earlier version article stated that Charles and David Koch have donated more than $628,000 to candidates and parties in 2011 and 2012. They have donated $411,000.